Do you manage an office park, a corporate office, school, warehouse or building maintenance? Are you looking for a professional company to offer Window Cleaners for your office park, school, warehouse or building? Are you looking for a commercial window cleaner? 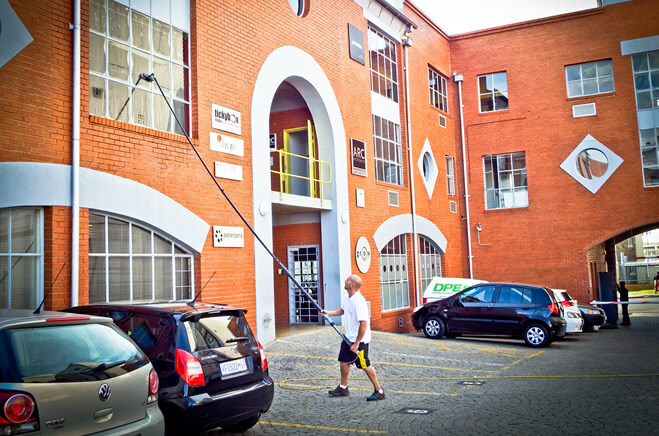 Spotless window cleaning are the on-site, contract-cleaning office park window cleaners service you are looking for. With window cleaning services provided to corporate clients in various industries, including Property Development, Hospitality, Engineering, Manufacturing, Events, Transportation, Banking, Catering and more. The ‘Reach and Wash’ system uses 100% pure water to clean exterior surfaces, the purified water works as the cleaning agent. Water in nature is impure and in its pure state strives to get back to its ‘original impure state’, so when it comes into contact with a dirty surface it absorbs the dirt returning to its ‘natural state’ and leaves the surface clean. Pure water has no dissolved solids within it and this is why when it is left on an already clean surface it dries completely crystal clear and streak free. If you are not 100% satisfied with our services. We will return and re-wash the unsatisfactory windows free of charge.